↑ 1,0 1,1 German National Library, Berlin State Library, Bavarian State Library et al. Record #118689436 // Gemeinsame Normdatei — 2012—2016. ↑ Ghosh, P.S., 1999. Whither Indian Polity?. Economic and Political Weekly, pp.3340-3342. ↑ Sanghavi, Nagindas. "From Navnirman to the anti-Mandal riots: the political trajectory of Gujarat (1974–1985)." South Asian History and Culture 1.4 (2010): 480–493. ↑ Priyadarshi, D., 1975. Case Study: Smt. Indira Nehru Gandhi vs. Shri Raj Narain and Anr. on 7 November 1975. 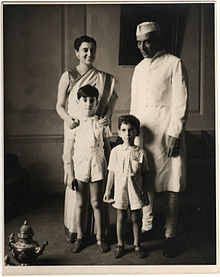 Indira Nehru Gandhi vs. Shri Raj Narain and Anr. on, 7. ↑ Nixon's dislike of 'witch' Indira, BBC News, 29 June 2005. BBC News (29 June 2005). Retrieved on 18 June 2011.